A healthy, low carb breakfast! 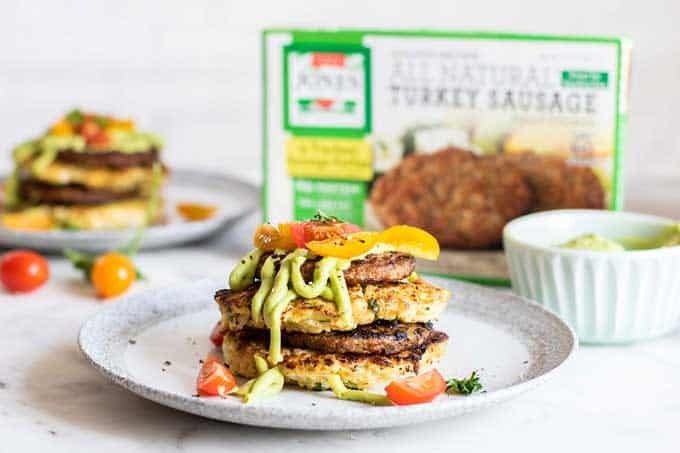 These Cauliflower Fritter Sausage Stacks are easy to make, and are drizzled with a creamy avocado sauce. A delicious healthy breakfast that is perfect for meal prep. This post is sponsored by Jones Dairy Farm — a company committed to bringing high quality breakfast meat options. I love that this company has healthier options, such as sugar free and nitrate free bacon, and antibiotic free and sugar free turkey and chicken sausage. I only work with brands whose products I genuinely love. Thank you for supporting the brands that help keep Sunkissed Kitchen running! I’ve been wanting to try making the best cauliflower fritters for a long time. 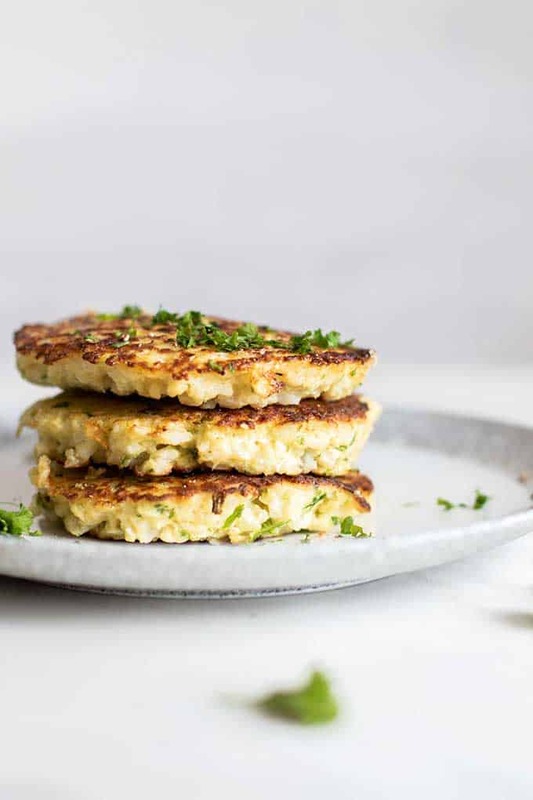 In the past, I’ve tried them, and ended up with either overly-crunchy cauliflower that didn’t quite cook as I browned them, or fritters that were too watery and didn’t hold together well. 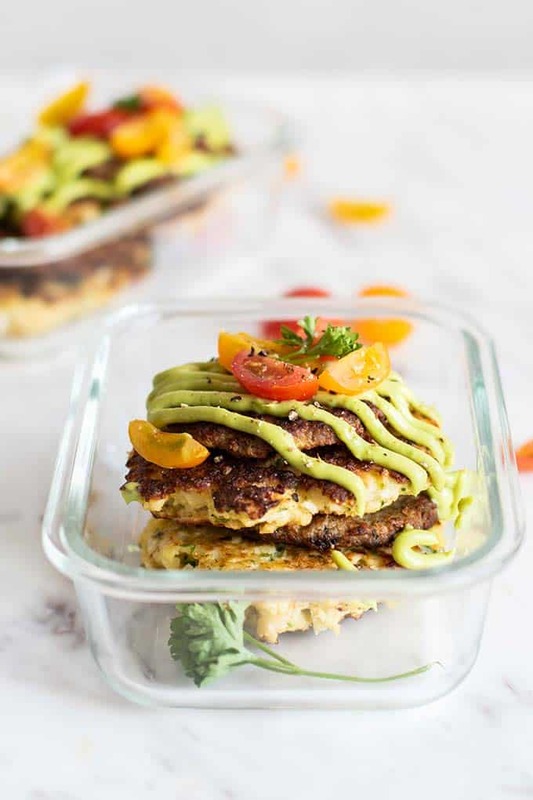 I finally nailed the perfect process for making paleo & low carb cauliflower fritters, and have a fun way to stack them for a delicious breakfast! First, coarsely “rice” the cauliflower in a food processor. This can be done by hand, but who has the patience for that?! I leave the cauliflower in larger pieces than I do when I am making cauliflower rice. Next, microwave (or steam, if you don’t like to use your microwave) the cauliflower for about 4 minutes until it’s hot and softened. Add the cooked cauliflower into a large clean dish towel, and then squeeze hard to press out about 3/4 cup of water. It might not seem possible when you start squeezing, but just keep twisting the towel to tighten it, and the water will start coming out fast! Mix the cauliflower with healthy, low carb ingredients and lightly season them — I add almond flour, eggs, sea salt, parsley, and salt. Simple! Serve with Sausage for a Healthy Keto and Whole30 Breakfast! 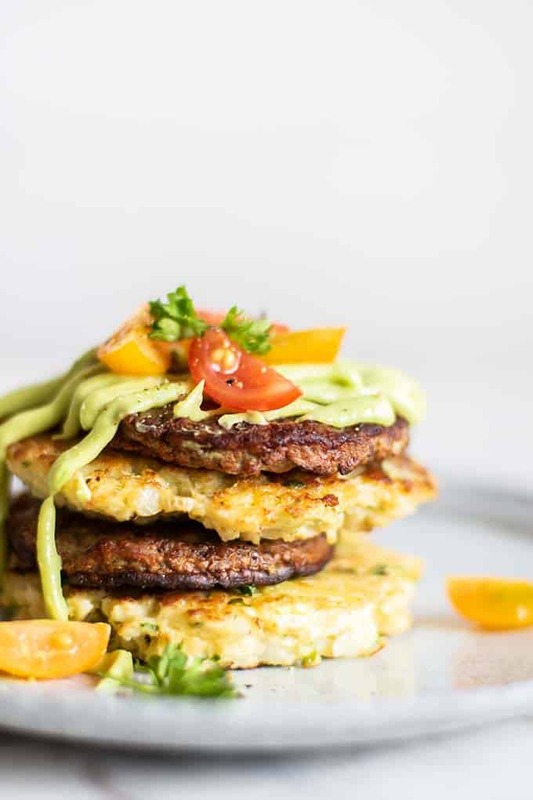 I’ve taken these cauliflower fritters and turned them into a super delicious (and easy) breakfast. 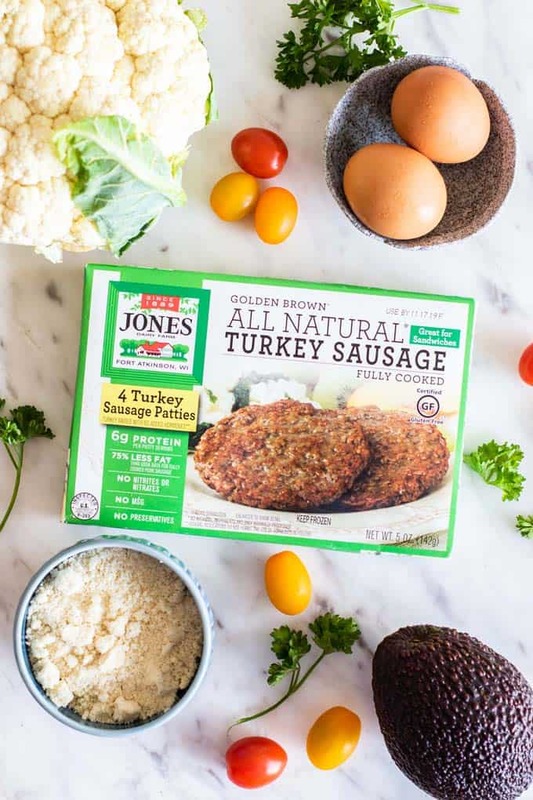 This breakfast is low carb thanks to Jones Dairy Farm All Natural Golden Brown® Turkey Sausage Patties made with no MSG, no preservatives and 6 grams of protein per serving. I love the range of breakfast options that come from Jones Dairy Farm. If you’re looking for healthier breakfast meat options — they have a great variety that includes pork, turkey and chicken products. What I truly love about this company is its limited ingredient list – meat and spices. No fillers, no preservatives, no nitrates or nitrites. Check out Jones Dairy Farm’s product locator to see which items are available near you! 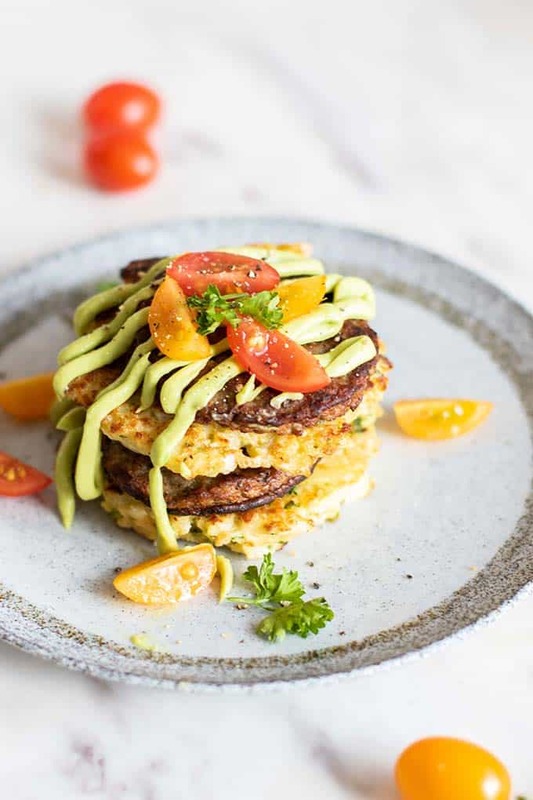 You can keep these cauliflower fritter and sausage stacks super simple — or dress them up like I did! I drizzled these with a creamy avocado sauce — just avocado, lemon juice, salt and cumin. Whir it up in a food processor for about a minute, and then drizzle or spoon it on top! What I love about this sauce is that it doesn’t go brown! The acid in the lemon juice makes this sauce stay good refrigerated for days! So drizzle it on, keep it on the side, use it on your salads or tacos or whatever else you love! 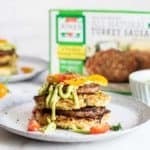 A fun and healthy low carb breakfast -- golden fried cauliflower fritters stacked with healthy turkey sausage, and drizzled with avocado sauce. Add 1/2 tablespoon of avocado oil to a skillet over medium heat. Add sausage patties, and 2 large mounds of the cauliflower mixture. 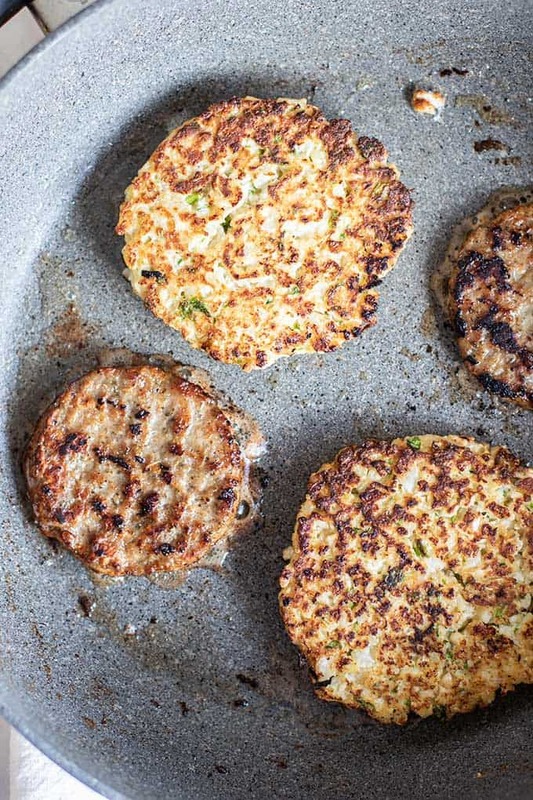 Use a spatula to press down the cauliflower into round patties. Cover the skillet and allow to cook until golden brown, about 5-7 minutes. Carefully flip the cauliflower patties and sausages, and continue to cook uncovered for 4-5 minutes. Repeat until all the cauliflower mixture and sausages are cooked. Drizzle with avocado sauce and chopped tomatoes, if desired. 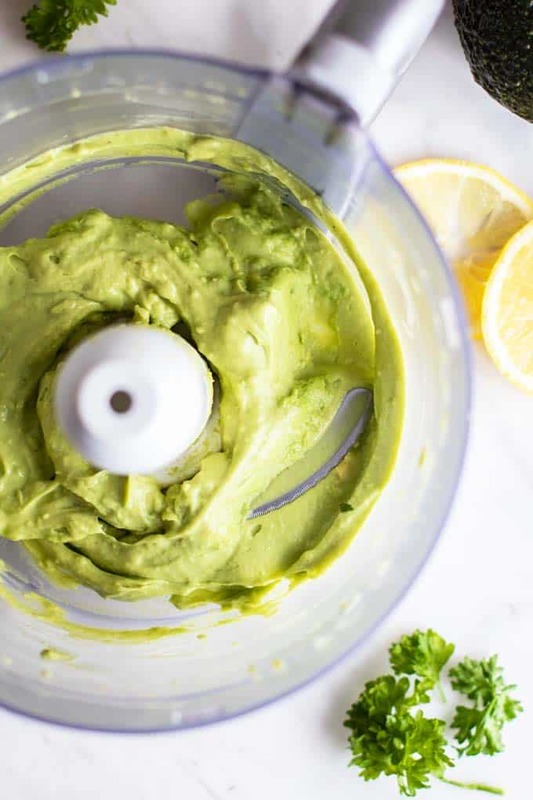 Add avocado and all other ingredients to a food processor, and process until smooth and creamy. 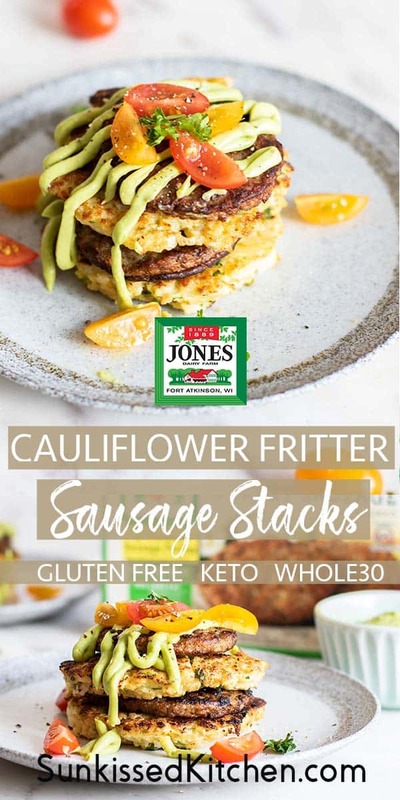 This Cauliflower Fritter Sausage Stack post may contain affiliate links, meaning if you make a purchase, I will receive part of the sale as a commission. This helps me continue to bring you lots of fresh and inspired recipes!